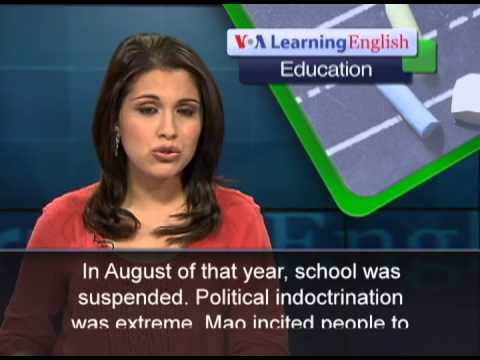 From VOA Learning English, this is the Education Report. Almost 40 years have passed since Chinese Communist leader Mao Zedong died and his Cultural Revolution ended. Changes in Chinese life caused widespread suffering during the Cultural Revolution. In recent times, some aging teachers and student leaders who lived through this period in Chinese history have been telling their stories. One of the first such stories published in China told of an apology from a student to a teacher. The apology gained attention in the West since appearing in China in 2010. The teacher was Chen Bi, now 90 years old and retired. She worked at the Beijing Foreign Language School during the Cultural Revolution. Today, Shen Xiaoke is a 60-year-old lawyer. He was a teenage student at Chen Bi's school in 1966. In August of that year, school was suspended. Political indoctrination was extreme. Mao incited people to denounce teachers, intellectuals and others in important positions. Students influenced by his speeches turned against Chen Bi. Chen Bi recalls the period with horror. She says, "For us who were persecuted, it was a nightmare." Shen Xiaoke says he heard many students argue among themselves about who was the most revolutionary. People tried to prove they were revolutionaries by hurting other people. Chen Bi said if students did not strike others, they would be accused of opposing the Cultural Revolution. So people who were normally not aggressive would start hitting victims.Three years ago, Shen Xiaoke decided to face the past. "We need to apologize to our teachers," he says. He wrote Chen Bi an apology letter. He expressed his regrets for himself and for others in his class. For VOA Learning English, I'm Alex Villarreal.